Thank you for visiting Santa's Candles website. We started our candle business 12 years ago. Why did we started a candle business??? because, we didn't want to buy poor quality candles anymore that didn't burn right or after an hour burning you forgot what scent you bought. When we started to make candles; however, we spent a lot of time and money. We wasted a lot of scents, dyes, waxes, wicks and jars...... To make the perfect candle was not easy; however, after a while, we finally made what we think is a great candle, burning evenly and having a great scent throw, then slowly we started to introduce our candles to the world. Our candles have strong scents and have beautiful colors because of we put a lot of time into making the best candle possible, this is why we hand pour every candle. 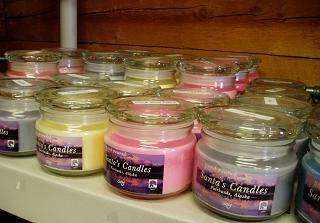 We also care about environmental, so we make our candles, tarts and beads by using 100% pure soy wax. Recently, we just introduced our new products which are soy tarts and soy beads. Many customers like them and we are very happy. Right Now, we sell our products at many fairs and festivals, such as the Alaska State Fair, Tanana Valley State Fair, Christmas Bazaars, Home and Craft shows and online, as well as wholesale, plus now we have a retail store. We are so glad that we have many loyal customers helping our company grow and look to the future. We love our candles, tarts and beads. We are always working to improving them and always coming out with new scents. If you would like to know more about our company or products, please feel free to contact us.